The Master Carvers Association was founded in 1897 as an employers association, by a number of companies who employed carvers, to enable national negotiations with the emerging unions. In 1992 the rules of the Association were changed to enable individual self-employed carvers to become members. Then, to widen the scope of the association, in 2009 the rules were changed once again to create a third category of membership: associate member. This category is open to budding carvers and others who have a particular interest or contribution to make to professional carving. There were previously just two categories: full and honorary. The honorary category is reserved for those members with distinguished careers who retire. Today the Association remains alone in representing professional carvers and has become the only body able to uphold the standards of the carving crafts. All members are professional carvers with years of experience. To join one has to submit a portfolio of recent work and to have been in business for a minimum of five years. The committee reviews each application for membership. 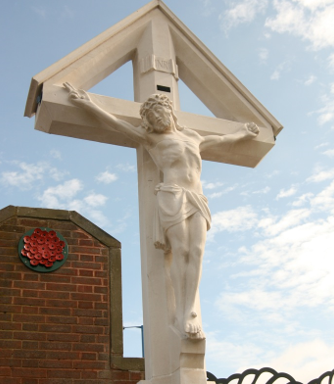 This Portland Stone crucifix, situated in Moxely in the West Midlands, is a restoration of an original damaged statue by West Sussex based Master Craftsman Graham Heeley. For more examples of his work visit www.grahamheeleystudios.com. 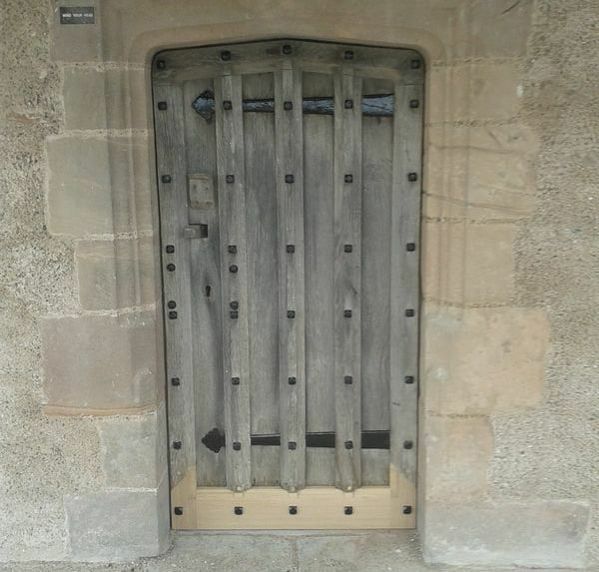 Houghtons of York recently had the pleasure of being asked to travel to Lindisfarne (Holy Island) in Northumberland to examine one of the castle doors and bring it back to their workshop for repair. Following an early start Houghton's joiners reached site at 8:30am and made their way to the door. They were met on site by the property’s building surveyor and discussed the methods by which the door was to be repaired and together agreed the best way to proceed. MCA member Paul Wilson was commissioned by the renowned designer Shalini Misra to design and carve elements for the Paradise Fountain - a 2.5m x 2.5m chandelier with 52 handmade barley twist crystal arms and pans with 52 specially made video candles and over 3,500 individual Swarovski crystals - which was mounted under an opulent red velvet canopy as a central feature at the prestigious 2017 Decorex Champagne Bar at Syon Park, London. Paul worked with the third generation chandelier maker Clartés Bohemia and Theo Vanderzalm. The fountain was based on an iconic feature of The Great Exhibition of 1851 and Paul sourced 180 year old English lime for the commission. His brief was to design, carve and gild parakeets, which are now indigenous in London, together with 600mm high Prince of Wales feathers to be mounted as a central feature of the chandelier with a vegan remit. This meant moving away from some traditional methods whilst achieving the same end result using the Kölner Instacoll gilding method - ie not using animal skin glue, size or squirrel hair tips for gilding. The whole project took 380 hours to complete. A fantastic time lapse video showing the construction of the new cathedral of St Paul, Minnesota pipe organ casework, where all of the hand carving was done by member company Agrell Architectural Carving can be see below. Designed by architect Duncan G. Stroik, the organ was restored by Quimby Pipe Organs and project managed by JE Dunn Construction. Additional crew included riggers Sam Hartshorn and Rich Weirick and site engineer Jason Feldman. Time lapse photos courtesy of Tim Schindler, Director of Operations at The Cathedral of St. Paul. Video produced by Robert Firestone. The music is Bach's Gigue Fugue, played by Diane Meredith Belcher and recorded by Joe Vitacco on a Quimby Pipe Organ. Cathedral photo credit to Alexius Horatius. Guild Member Emyr Hughes attended the City and Guilds of London Art School 1981 and became a Master Carver in 1997 after working on the restoration of Windsor Castle in 1997. He specialises in giltwood and architectural restoration, pastiches of period ornamental pieces and sculptures and has been commissioned by historical houses, museums, National Trust, churches and private individuals. Other members include Charles Oldham of Charles Oldham Fine Woodcarving. The photo on the left shows Charlie standing proudly on the staircase of the Oldham Civic Centre having just fixed them all in place. "Oldham hands carved Oldham Arms" as the painter, Sarah Godsill, memorably put it! Graham Heeley Studios is a workshop based in Cranleigh, Surrey, making commissioned sculpture-based work through carving and modelling. Having recently carved and fitted two limestone plaques of hunting subjects, such as the trout for a large house in the Scottish Highlands, Graham is presently working on a house near Farnham in Surrey, carving a selection of bawdy scenes from Chaucers The Millers Tale in relief on an exterior exposed oak beam 16ft long and 12in high. Also underway is a figure of an angel to be finished in bronze resin for a chapel of rest. Last year Graham completed a project which required the supply of 150m2 of vaulting panels which were reproduced in resin at his workshop from a set of originals that Graham carved in oak. Member company, York based specialists Houghtons of York, are experiencing an encouraging and healthy demand for its high quality architectural joinery and woodcarving services with current projects running across Kent, Gloucestershire, Berkshire, and Scotland as well as around its base in North Yorkshire. The well established family run company have an exceptional highly skilled workforce renowned for their quality work and attention to detail. Houghtons of York are able to take on a diverse range of commissions from new-build, through to restoration, conservation, repairs and maintenance for clients that include Private Homeowners, The National Trust, English Heritage, Parish Churches, Cathedrals and Contractors. The specialist wood carving department of the company are currently repairing the 400 year old Christchurch Gates at Canterbury Cathedral. Each of the gates estimated to weigh over 1 Tonne have been removed for cleaning and the repair or replacement of damaged carvings. The company were called in to offer initial advice to the Cathedral Architect back in 2009 with work only commencing on site in November last year. The delicate work is anticipated to take 4 months to complete. One member, Conrad Thompson, has branched out into plastering with a newly formed company. This new company is made up of Conrad, sculptor and designer, and Bob Lewis ex-Technical Director of the Bristol plaster firm, Hayles and Howe Ltd.
Bob Lewis has been plastering for 35 years, many of those years at Hayles and Howe where he helped devise many of their techniques. They have got together to supply a top quality ornamental plastering service. This service includes: - Artwork, Design & Drawings; Sculpture, Ornamental and Figurative; Plasterwork – Manufacture and Installation along with Plasterwork Conservation & Restoration. Francois Loudwig has been a professional woodcarver since 1983 after graduating in France. He honed his skills from working in several European countries before settling in England. Francois specialises in fine art framing and has framed some of the worlds most famous painters. Among then Titian, Cannaletto, Botticelli, Raphael, Turner, Monet, Degas and Picasso. His frames can be seen in galleries and museums throughout the world. Including the National Galleries of London, Washington USA and Melbourn Australia. The Getty Museum, Los Angeles, the Bridgestone museum, Tokyo, and the Liechtenstein museum, Vienna. He also undertakes a wide variety of reproduction and restoration projects for the national Trust, antique dealers, interior designers, joiners and also creates period props for the film industry. Pictured is a superb large Mathias Clock Mirror (circa 1745). Formerly from the Ditchley Mansion in Oxfordshire and subsequently owned by Ferdinand Marcos, one time ruler of the Phillipines, it is shown after being restored and regilded by Matthew. Founded by Master Carver Ian Agrell and recognised as recognised as one of the foremost architectural carving companies in the world, Agrell Architectural Carving Ltd specialise in classical design and hand carving for private residences, commercial buildings and ecclesiastical structures. Using the same methods and tools used by the generations of wood carvers before us, their superior hand carving includes decorative moulding, capitals, brackets, carved paneling, Gothic screens and hand carved furniture. Master Carver Tim Crawley was commissioned to carve and install a new marble fountain at Kenilworth Castle as part of a larger project by English Heritage to recreate an Elizabethan garden. The castle was given by the Queen to her favourite, Robert Dudley, Earl of Leicester, in 1563. In 1575 he entertained her there with a party so extravagant that it nearly bankrupted him. It is possible the young Shakespeare was present, later incorporating certain events in A Midsummer Nights Dream. The 19 day celebration, and the garden with the fountain at its centre, was described in a letter by Robert Langham. This document was the main source for the restoration, intended to enhance the experience of visitors to the site. A selection of members can be found in our online directory.